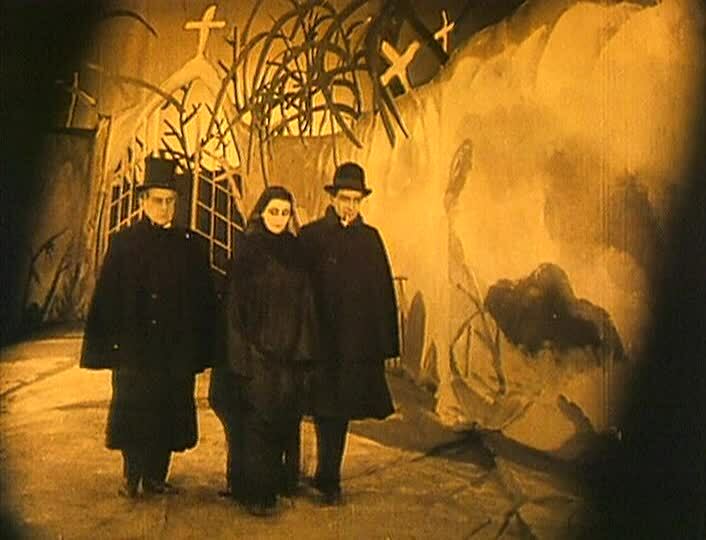 The Cabinet of Dr. Caligari Review(1920) German Surrealist Silent flick, the first feature length horror movie ever made… – Stigmatophilia's gore splattered corner of insanity. If Tim Burton had been around in the 1920’s this is the film he would have made, it is obvious that the surreal, nightmarish and otherworldly landscape featured in this German 1920s silent horror film has had an obvious influence on some of the well-known tropes in horror cinema today and also on film noir. Dark shadows, creeping menace, it is all here, with the most beautiful gothic undertones I have ever seen grace the screen. The Cabinet of Dr Caligari is both compelling and irresistible. Directed by Robert Wiene, who later in his life fled Nazi Germany, this film has been cited as one of the most influential horror films of all time. The first feature length horror movie, which pre-dates Nosferatu by two years. It also owns the claim to the first ever plot twist in film, although this was not the movies original intention, the director was asked to change the original ending as it was thought to be too strong. What must the 1920’s audiences made of this gruesome venture, the likes of which they had never seen before. Perhaps the most compelling factor of this piece is the strange, expressionist landscape which Wiene presents, weird angular buildings, pointy trees and grass, strange winding staircases that seem to defy the laws of physics, and an overall sense of everything being a bit off kilter. I found this aspect strangely mesmerizing as the terrifying fairytale played out. 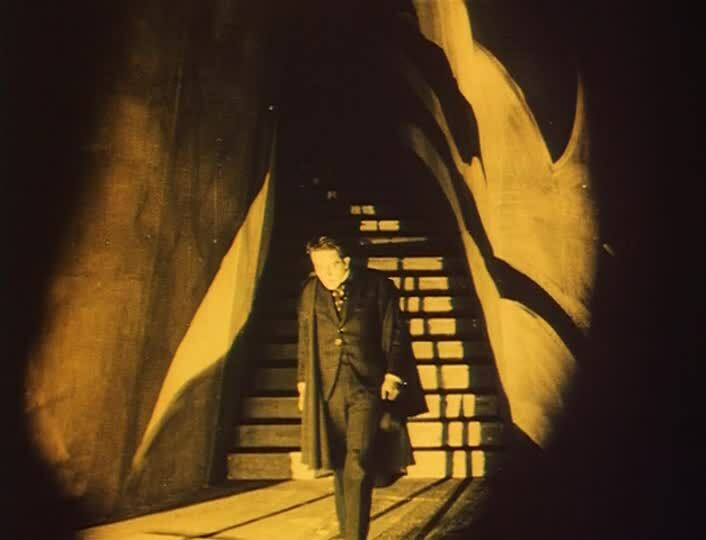 There is no denying there is something completely different about The Cabinet of Dr. Caligari, although you may feel it is also strangely familiar and you would be right. Not only have many of the concepts used in this film been copied time and time again through the annals of horror history, but the opening scenes are replicated for Rob Zombie’s music video Living Dead Girl. 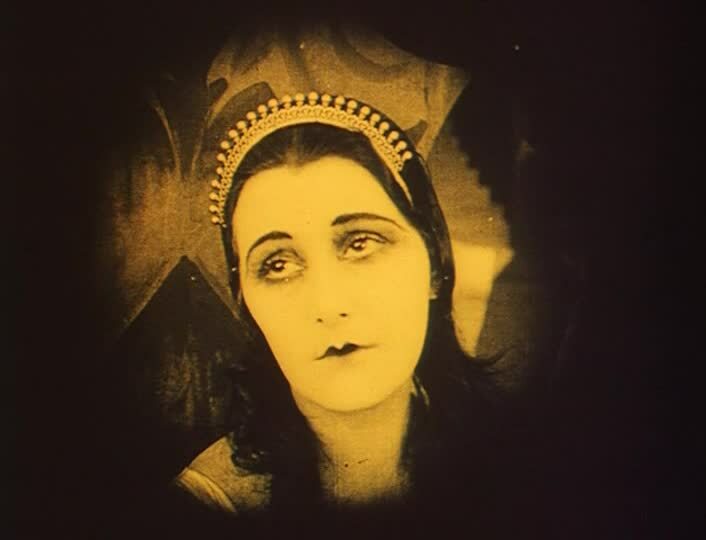 So enamored was Zombie with this film he plays homage to it, complete with a distinct silent movie era type editing, in his song named after the Jean Rollin film. The story begins with main character Francis (Friedrich Fehér) meeting a stranger and recounting the terrible events throughout which he and his betrothed Jane (Lil Dagover, who incidentally was known as one of Adolf Hitler’s favourite actresses and who entertained German soldiers during WWII) have recently lived through. We see Jane as she wanders past looking lost and forlorn. 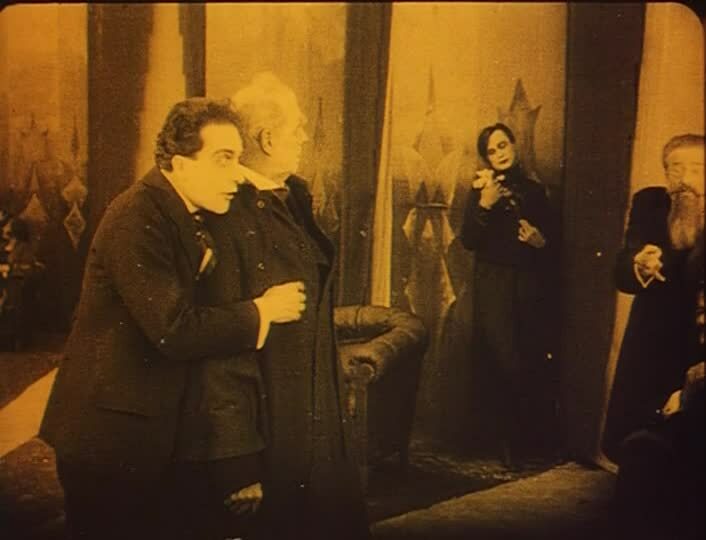 As the flashback begins the arrival of the strange Dr Caligari (Played by Werner Krauss in the role which launched his international career) in town with his sideshow the somnambulist Cesare (Conrad Veidt) who has slept for 23 years. The town of Holstenwall sits at the bottom of a weird skewed mountain on the bizarre two-dimensional set which provides the perfect scene for the intrigue to begin. The Dr can awaken Cesare to ask him questions, while he remains in a hypnotic trance only able to obey the Doctor’s commands. Apparently this zombified freak can see everything in the past and present, and while he is not doing the Doctor’s bidding we later see he is kept in a coffin, and spoon fed by Caligari. Francis and friend Alan who are both vying for the affections of Jane attend the show and when Alan asks the question when will I die he is greeted with the ominous answer ‘at first dawn’. Taking this in their stride the friends retire for the night only for Francis to be deeply shocked when on waking he finds the somnambulist’s prophecy has come true and his friend has died in the night. What follows is a tale of murder, suspicion, and one of the most epic plot twists ever in this macabre little tale. 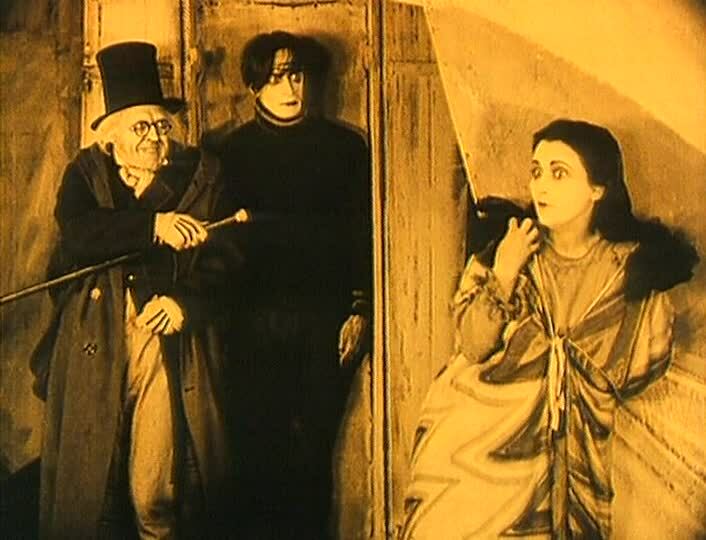 For the cast Krauss as Caligari is fantastically evil looking complete with menacing black cape and top hat, and the maddest staring eyes which take on a character all of their own. With a lack of dialogue a lot of the emotion is played through the eyes of the associated characters to convincing effect. Dagover as Jane plays out her wide-eyed innocence in beautiful vintage style, again through a series of facial expressions, while our hero Francis is portrayed as suitably desperate to get to the truth and protect those around him by Fehér. Despite the lack of talking or explanation the cast really manage to pull you into their roles, and you are on the side of the hero all the way. 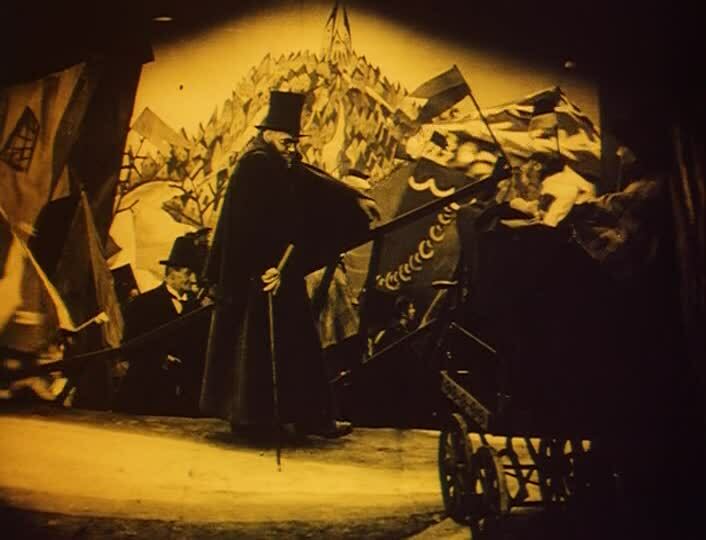 Veidt as somnambulist is decidedly creepy, and in one particular scene where you see him lurking through the deserted night-time streets of Holstenwall he moves like a dancer in a strange warped ballet performance, and it is these little nuances that make The Cabinet of Dr Caligari so special. I found watching these mesmerizing performances from people who have long since left this mortal coil added to the dark undertones of the piece, in that it was like watching ghosts from the past who inhabited a completely different world to the one we know today. Yet they were setting down the laws for the genre we love so much, and I wonder whether they were aware that what they were producing would be so groundbreaking. 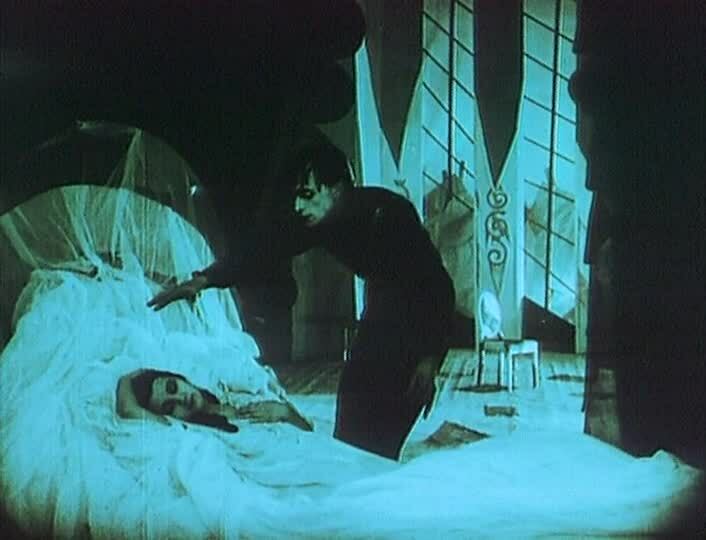 The Cabinet of Dr. Caligari is one of those fabulous gems which once unearthed will keep you spellbound. An innovative trendsetter for its time, while tame by todays standards, nevertheless remains dark and compelling. From an era long since passed it remains testament to the fact that horror has been one of the longest running genres in cinema and the fact that cinemagoers have always loved to be scared out of their wits. Without the familiarity of horror tropes such as shadows, and black cloaked figures lurking the streets one can only imagine the effect this had on first time viewers who lacked the reference points we have today. Inspiring stuff, and in the public domain so check it out if you haven’t already! The Mad Ghoul (1943) (UK DVD review).